The kitchen stove you have in a tiny studio apartment will not be the same size as the one you have in a standard size kitchen or an over-sized gourmet kitchen. Though almost always the same height -- a standard 36 inches -- and depth -- 28 1/4 inches -- the width of kitchen stoves can vary considerably and should be determined by kitchen size. Stove sizes can vary from compact to oversized. Apartment or studio stoves are designed to be compact. Usually, they are 20 to 24 inches wide but still include the standard four burners. 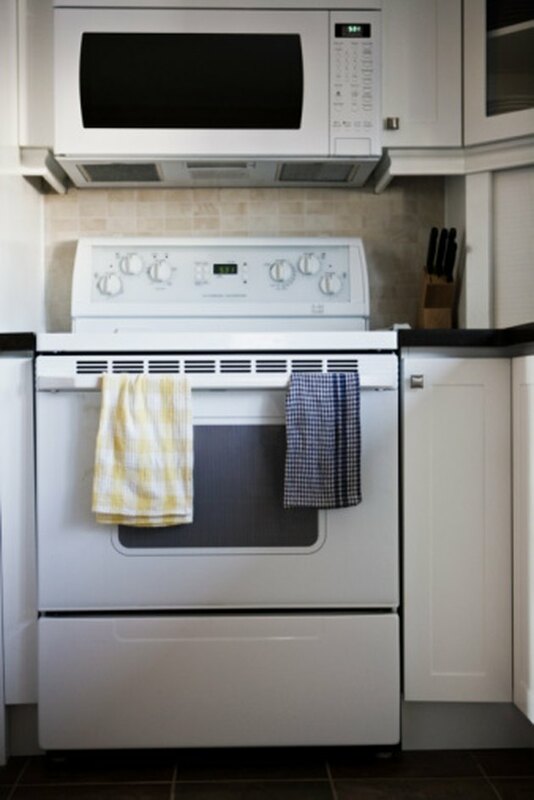 Though small in size, apartment stoves often include features such as timers, delayed start and self-cleaning programs. Standard kitchen stoves are 30 or 32 inches wide with four burners and a standard-sized oven. They can be ordered with the basic accouterments or extra features, such as self-cleaning and timed start. Larger, luxury kitchens often have oversized stoves -- up to 40 inches wide -- which include such extras as double ovens, convection capabilities, warming drawers, down-draft stove-top grills and additional burners. What Are the Differences Between a GE Profile & a GE Café?